Television viewers in parts of Lancashire and the south Lakes were left without reception because of problems updating a transmitter. Parts of the mast in Lancaster being replaced in preparation for digital switchover suffered a "serious failure" during work on Wednesday. Engineers later got the main Lancaster transmitter back on air, although it was not running at full power. It means viewers receiving a signal are likely to experience poor reception. A BBC spokesman said: "Work to restore services will start again at first light on Thursday and we hope to have them back to normal during the day. "The BBC regrets and apologises for this serious disruption to services." Viewers able to receive a picture have been warned to expect another break in services while the work is carried out. Every transmitter in the country will have to be replaced or upgraded before analogue services are switched off completely by the end of 2012. 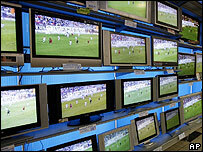 The digital switchover is due to take place in the north west of England in 2009.